Chris and I are shortly off to Amalfi in Italy. For the first time since I moved to Livingstone nearly six years ago, we’re going to be experiencing a chilly Christmas and New Year … a reprieve from our scorching summer days and ferocious thunderstorms that often crash about us through the summer months. We’re going à deux to relax, to celebrate, and to EAT! As a lark, I’m taking my Dakasu Limoncello and Wild Panforte to share with our Italian hosts, and as well, to do a comparison between their real thing and my wild thing. 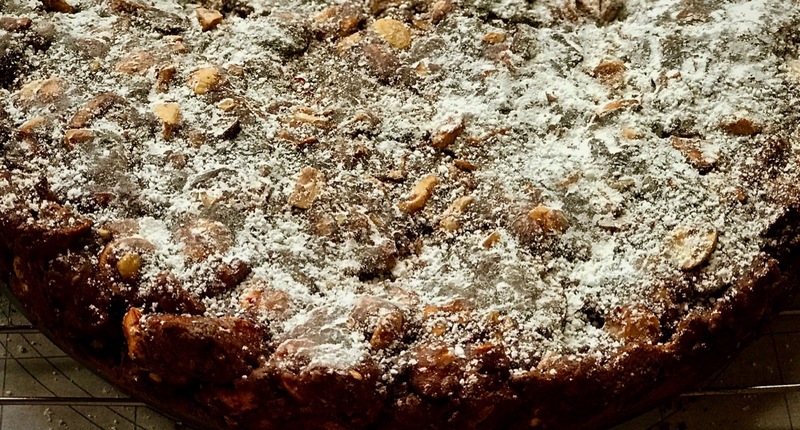 I surmised, then, that there would be no better time than to repost a commission I wrote earlier in the year for Rothschild Safaris on my Wild Panforte, for all those bakers who are as obsessed with this Italian confection as I am. My Wild Panforte is made, in part, with bush fruit and nuts and preserved citrus from my garden. Panforte, the Italian “strong bread” dating back to 13th century Siena in Tuscany, should, by all accounts, be made with seventeen ingredients, each one representing the number of contrade within its city walls. I follow this seventeen-ingredient rule in my Wild Panforte, making sure that as many components as possible represent my own locale in the upper Zambezi Valley, having sourced them from the surrounding bush, my organic garden, and the native markets. The fruit and nut mix includes dried nsumo fruit, dried kumquats, preserved lime and mongongo nuts, among others. This dense, chewy confection—traditionally prepared for Christmas but now served year-round—is simple to make. There are no hard and fast rules as to what ingredients you can use, and I’ve read that all over Italy various interpretations of the original panforte recipe are jealously guarded. Here, it gives me pleasure to share my recipe with its wild fruit and nuts, its preserved lime and dried kumquats. Shelling the mongongo nuts in my kitchen. Panforte’s renowned bold spicing is referenced in medieval texts and, according to Felicity Cloake, illustrated that “a heavy hand with the imported pepper was a sign of seasonal largesse.” When I first tested my Wild Panforte last Christmas holidays, it turned out my seasonal largesse was somewhat greater than my husband’s, who found my original recipe too hot. I’ve tweaked it subsequently, cutting the quantity of red peppercorns in half, ensuring that the first bite isn’t quite so eye-watering. Roasting the hazelnuts and mongongo nuts, which have a similar shape but very different taste and texture. When preparing panforte, remember that the honey/sugar mix cooks quickly. If you overcook the sugar, or bake the cake for too long in the oven, the cake will turn into a rock-hard tooth-breaker. The texture is critical to a perfect panforte, so take extra care. Wild Panforte after coming out of the oven. Heat the oven to 160C degrees. Grease a 20cm cake tin with a removable base with coconut oil, dust the sides with cocoa powder, and line the bottom with rice or greaseproof paper. Set aside. Dry-roast all the nuts until they are golden brown, making sure they do not burn. Roughly chop a third and set aside to cool. Put the flour, cocoa and spices into a large mixing bowl, whisk to combine. Stir in the fruit and all the nuts. Set aside. Put the caster sugar and honey into a medium saucepan over a low heat, stirring occasionally only until the sugar has dissolved. Cook until the syrup reaches 115C degrees on a candy thermometer, or until a little dropped into cold water forms a soft ball when pushed between finger and thumb, about 3-5 minutes. Remove the syrup from the heat and immediately add to the dry ingredients. Mix until very well combined. Transfer into the prepared cake tin and press the mixture down with damp hands. Bake until just firm, about 30 minutes, being careful not to overcook it, or it will be too hard once cooled. Let the panforte cool for 15 minutes, then run a palette knife around the edge to loosen it from the pan. Remove carefully, and let it cool completely. Dust with icing sugar and rub it in with your hands. Store in an airtight container for up to a month.